They also have a great selection of Christmas Decor. I was very excited when I got a chance to pick out something from their holiday selection to feature here, and I was thrilled to find this Ornament Wreath. As you know, I LOVE wreaths! 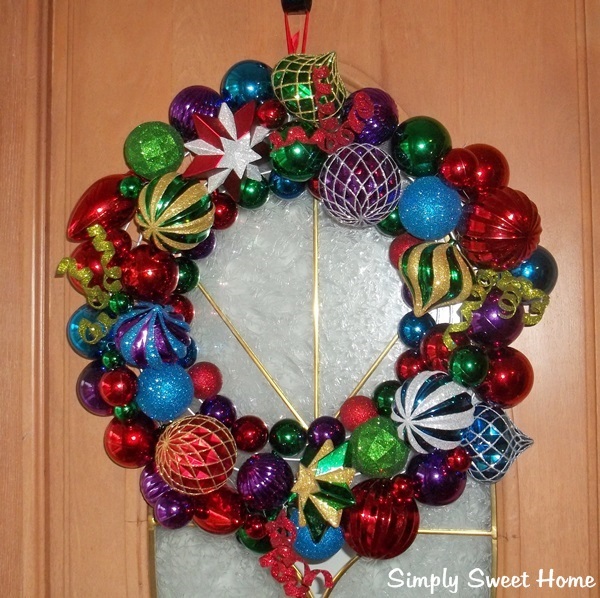 Around Christmas time, I especially love wreath ornament wreaths and anything with bright, bold colors. This wreath is great size, about 22 inches in diameter, and it is very full. And as you can see, it includes a whole host of balls in a mirror finish, glitter finished, and striped balls. There’s also some really cute stars, light bulb shaped balls,and glittery curly-qs. I placed my wreath on my front door yesterday, and I’m very pleased with how it looks! And did I mention, this wreath sells for just $25? What a great bargain! Giveaway! Thanks to CVS/Pharmacy I have the opportunity to offer one Simply Sweet Home reader the chance to win their very own ornament wreath just like the one I received. I really love putting up the stockings! Candles are great décor too. I love icicle lights. They are so pretty. Your ornament wreath is gorgeous!!!! I saw this on My Girlish Whims! My favorite holiday decor is lights. Homemade ornaments that the kids have made over the years, along with swags around the doorway. My Nut Crackers are my favorite holiday decor. I love to have little trees all over the house. I love nativity decor, love candles too!! !